Zaria McDonald received a gift card through Friends' Special Assistance Program to purchase anything she desired. 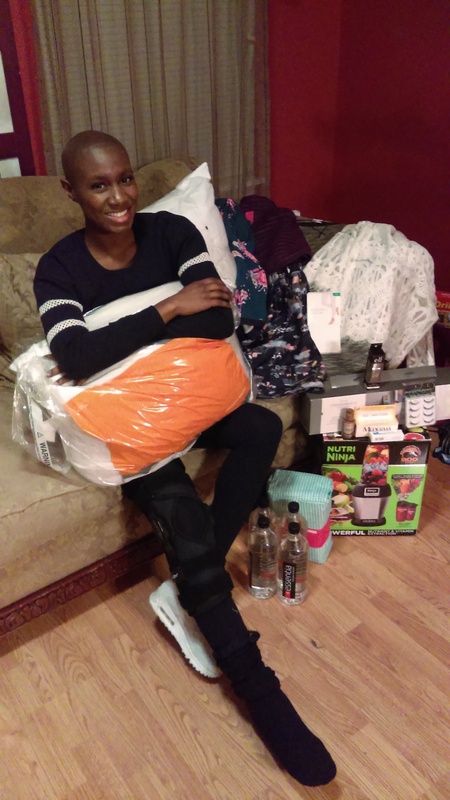 Zaria bought a few things she needed, and some fun items she wanted. We are so happy that she enjoyed her shopping trip! Here's a thank you note she sent to our Program Coordinator, Margie Sedlack. "I wanted you to know that I did receive my gift card. Thank you so much! This gift card was very helpful. I purchased a Nutra Ninja to keep up my healthy diet, alkaline water, Mederma to get rid of my surgery scar, hanging shelf for my wigs, pillows and sheets, makeup and clothes. I really appreciate this!" Through our Special Assistance program, a child is given a $350 gift card each year they are in treatment. To these kids, they feel like they have won the lottery...and that's exactly how we want them to feel.